What is the Fed Doing? Last week, the statement following the Federal Open Market Committee meeting was accompanied by a summary of projections by the participants, which included for the first time projections on future interest rates. The FOMC also released a statement clarifying its policy goals, and Bernanke held a press conference. The maximum level of employment is largely determined by nonmonetary factors that affect the structure and dynamics of the labor market. These factors may change over time and may not be directly measurable. Consequently, it would not be appropriate to specify a fixed goal for employment; rather, the Committee's policy decisions must be informed by assessments of the maximum level of employment, recognizing that such assessments are necessarily uncertain and subject to revision. That sounds like a statement about the "natural rate" or NAIRU, which changes over time, and which economists can disagree about. In this context, "maximum level of employment" isn't a very good phrase - it sounds like something Stalin would try to achieve in industrializing the Soviet Union - but "maximum" is the word in the Federal Reserve Act, so they probably wanted to stick with it. To be fair, though most of the participants are projecting a rate increase by 2014, all of the projected rates are still quite low relative to their "longer run" projection. So what then might the Fed do if its target interest rate, the overnight federal funds rate, fell to zero? One relatively straightforward extension of current procedures would be to try to stimulate spending by lowering rates further out along the Treasury term structure--that is, rates on government bonds of longer maturities. There are at least two ways of bringing down longer-term rates, which are complementary and could be employed separately or in combination. 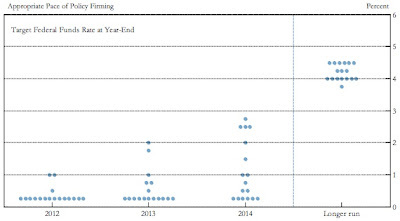 One approach, similar to an action taken in the past couple of years by the Bank of Japan, would be for the Fed to commit to holding the overnight rate at zero for some specified period. Because long-term interest rates represent averages of current and expected future short-term rates, plus a term premium, a commitment to keep short-term rates at zero for some time--if it were credible--would induce a decline in longer-term rates. The problem for practitioners, however, is the time inconsistency of these proposals. It is one thing to promise now to hold interest rates at zero if inflation starts to rise in several years time, and quite another actually to do that in the circumstances of the time. The temptation to renege on a long forgotten commitment, possibly made by an earlier Fed chairman under a previous administration, would surely be overwhelming once the economy is recovering. Since the private sector knows in advance that this would be the case, it would be extremely hard to persuade people today that such a policy would in fact be pursued in the future. And that would defeat its purpose. However, while many knowledgeable observers are interpreting it that way (e.g., Stephen Williamson and Ryan Avent) it seems to me that the Fed is being careful to say that it is not promising to keep rates low, only that it believes the economy in 2014 will still be lousy enough that rates should still be low then. During the press conference, Bernanke seemed to place quite a bit of emphasis on the dual nature of the Fed's mandate, and even said "the Committee always treats its primary objectives on price stability and maximum employment symmetrically." Really? In the past, I've thought he's seemed to give higher priority to inflation, so that sounded unexpectedly dovish to me. One interpretation might be that he's listening to Chicago Fed President Charles Evans, who has argued the Fed needs to be more aggressive to try to reduce unemployment. Scott Sumner also found dovish signs in the press conference. 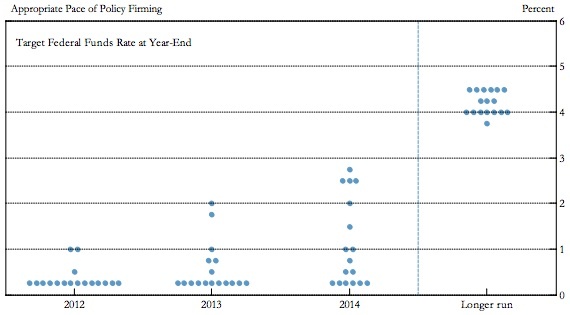 An alternate interpretation is Bernanke felt the need to be extra careful to sound like he is being faithful to the dual mandate because the statement making the 2% inflation goal explicit sounds like another step towards "inflation targeting," which Bernanke advocated during his academic days. Indeed, one of the reporters said: "Congrats on the inflation target or goal. That's a big achievement for you, I'm sure." So, what is the Fed doing? I'm really not sure, but I hope it works. Lael Brainard, America’s top financial diplomat, landed Thursday in Switzerland to help coax the European negotiations along. As the Treasury under secretary for international affairs, she has the urgent task of helping to persuade the Europeans to head off a financial crisis by building a firewall to quiet the markets once and for all — and doing so without any formal role in their negotiations. It is at times an awkward role, but the stakes are enormous, not just for the United States but for preservation of the euro zone and its currency. Ms. Brainard, 49, operates mostly behind the scenes, in private phone calls and discreet visits — 17 trips to Europe alone in the last two years. “They trust her, they reach out to her, they talk to her for ideas and to get us to engage,” said Timothy F. Geithner, the Treasury secretary, who is also in Davos this week. 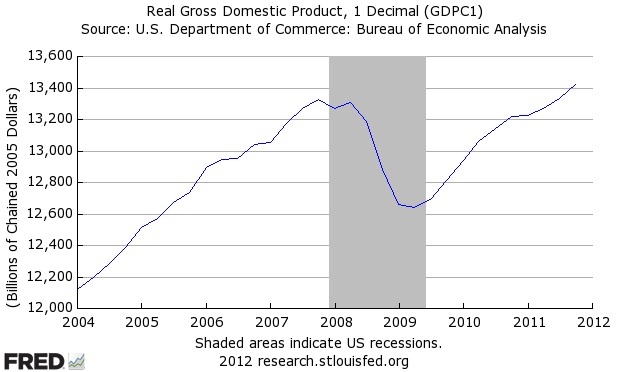 GDP grew at a 2.8% annual rate in the last quarter of 2011, according to the "advance" estimate the BEA released today. That can be taken as good news as it represents improvement over the first part of the year (growth rates of 0.4%, 1.3% and 1.8% in the first three quarters). But 2.8% is just the average growth rate over the past 40 years, so its not fast enough to significantly close the gaps in output and employment left by the recession. The advance estimate puts growth for the full year at 1.7%. We'll get the revised "second" estimate on Feb. 29. For more, see Wonkbook's Brad Plumer, Calculated Risk, NYT's Catherine Rampell. UK: Worse than the Depression? 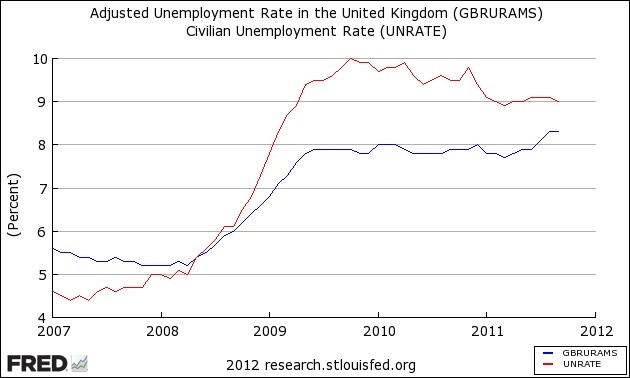 and cited it as evidence that the UK economy is now worse than the Great Depression. I haven't been following the UK situation closely, but I'm instinctively inclined to agree with their criticisms of the Cameron government's austerity policies. Having said that, I think the graph (and implied interpretation) is a little unfair because of how Britain's experience during the interwar period differed significantly from that of the US. 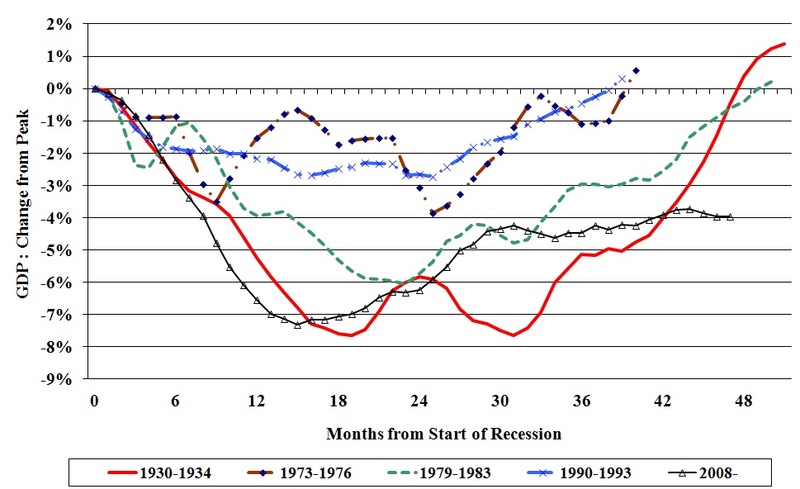 While the US economy went pretty suddenly from the "roaring 20's" to the depression, the UK economy was already in bad shape throughout the 1920's, which I believe can be primarily attributed to the attempt to resume the gold standard at the pre-war parity (the infamous "Norman [Montagu] Conquest of $4.86"/ "Economic Consequences of Mr. Churchill") and the 1930's was just a further deterioration of an already dismal situation. 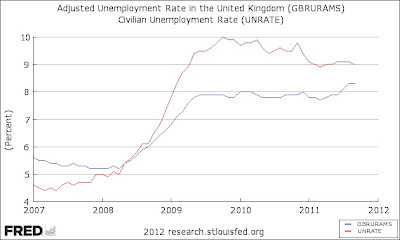 So, while it may be the case that the deterioration from 2008 in Britain has been comparable in magnitude and will be worse in terms of persistence than the decline starting from 1930, saying that its worse than the depression that ignores that Britain in 1930 already had an unemployment rate of 16%. *Since this is just a quick blog post, I haven't dug into the technical differences between various unemployment data series, but I'm pretty sure they would all show similar trends, if not exact levels. Contrary to the President's constant disparagement of people in business, it's one of the noblest of human pursuits. The late Steve Jobs - what a fitting name he had - created more of them than all those stimulus dollars the President borrowed and blew. [A]s Steven P. Jobs of Apple spoke, President Obama interrupted with an inquiry of his own: what would it take to make iPhones in the United States? 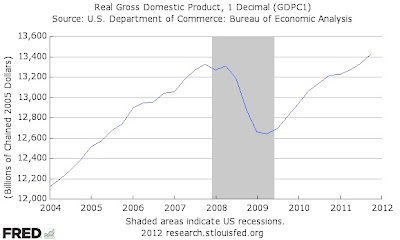 (According to the CBO's estimates, the impact of the stimulus peaked in the third quarter of 2010 at 0.7-3.6 million). Maybe it would be fitting to call the President Barack "US" Jobs. *Don't get me wrong - I'm a fan of his computers. There's alot to think about in the Times article - see Paul Krugman and Ryan Avent. However, many of the issues raised by it, and by the President's speech, about trade, education and "industrial policy," are really about the composition of employment. The total number of jobs at any time depends mainly on aggregate demand - and when there is a slump (particularly one the Fed can't handle), the appropriate fiscal policy response is indeed for the government to borrow some money and "blow" it. Update (1/27): Paul Krugman noticed the same thing, and wrote a column about it. This, then, is the Romney Conundrum—for conservatives, liberals, and everyone else. Even on the economy, Romney’s signature issue, it’s hard to know where his heart lies—and how he would govern in the White House. Would the former Massachusetts governor listen to his best and brightest? Or to his party base? Of course this isn't entirely unique to Romney - politicians often fail to follow through on politically inconvenient suggestions from economists (though the universe of what is inconvenient for a Republican primary candidate to say is pretty scary these days). Economists who have added up all the externalities associated with driving conclude that a tax exceeding $2 a gallon makes sense. That would provide substantial revenue that could be used to reduce other taxes. By taxing bad things more, we could tax good things less. Well, if Romney proposed that, it would probably take the attention off his tax returns! Me and the "Mussa Puzzle"
Probably his most influential paper — certainly the one that had the biggest impact on me — was his 1986 paper (pdf) on currency regimes and the behavior of real exchange rates. This bore on the question of whether exchange rate changes make adjustments in relative costs and prices easier; it bore more broadly on the question of whether prices are flexible, as fresh-water economists like to assume, or instead sticky in nominal terms. Mussa had a simple but powerful insight: if prices were flexible, then all relative prices should be determined by “real” factors, and their behavior shouldn’t change if, say, a country goes from a fixed exchange rate to a flexible rate or vice versa. As he pointed out, this proposition could be tested using a natural experiment, the breakdown of Bretton Woods and the move to floating rates. Did the behavior of real exchange rates — relative price levels expressed in a common currency — change? I've seen the large increase in real exchange rate volatility under floats referred to as "the Mussa puzzle", though, as Krugman points out, "sticky" prices are a straightforward explanation. 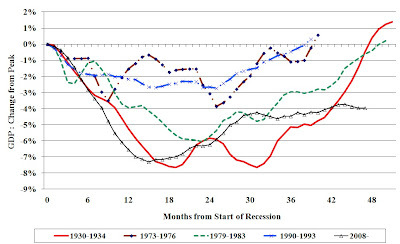 In particular, the high volatility of the real exchange rate since the breakdown of the Bretton Woods system in the early 1970s may have arisen as a consequence of factors unrelated to the nominal exchange rate regime - such as the two oil price shocks of the 1970s or the wide fluctuations in interest rates during the late 1970s and early 1980s. However, in "Across Time and Regimes: 212 Years of the US-UK Real Exchange Rate" (Economic Inquiry 48:4 [October 2010]), I exploited the fact that the exchange rate between the US and Britain has alternated a number of times between fixed and floating. One of the tables in the paper shows the average monthly change in the real exchange rate during different regimes. The pattern of higher volatility in floating periods is a robust one (and there is more statistical evidence in the paper). However, the differences between fixed and floating are smaller in earlier periods, which suggests that perhaps price stickiness has become more important over time.